RANKING ON THE FIRST PAGE OF GOOGLE FOR A HIGH TRAFFIC KEYWORD. Campmonk is an archway for the adventure freaks which gives access to breathtaking private campsites across India, encourages people to head outdoors, camp under the stars, and experience the Universe the way it deserves. Not only does Campmonk let you discover hundreds of private campsites, it also serves as an online portal for booking one of a kind events and experiences. Campmonk approached us seeking our digital marketing service of Search Engine Optimization (SEO) for their brand. Their goal was to improve their website ranking on Google, improve the website traction, build the digital presence, and grow the brand through SEO. In a nutshell, to procure quality leads through SEO at minimum cost. Campmonk gave us the complete liberty to experiment with the campaigns. 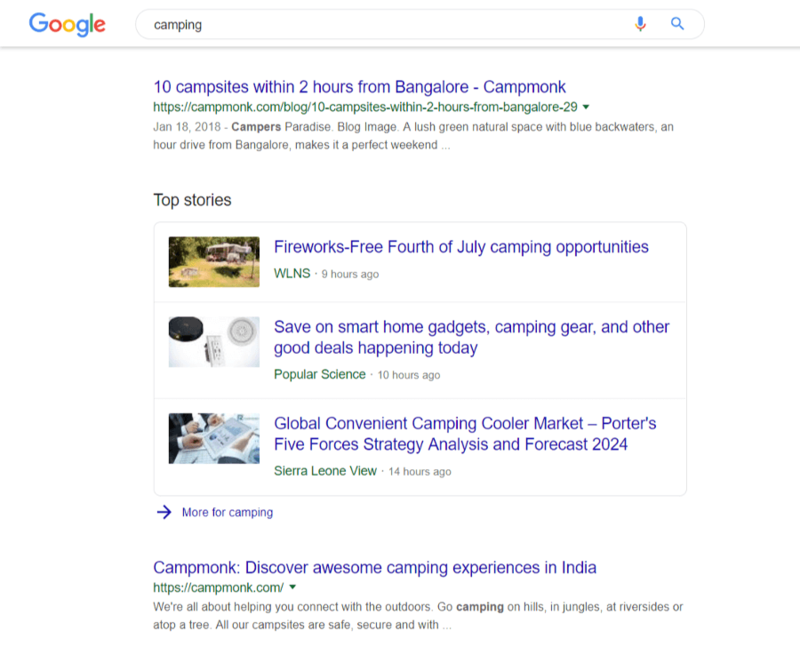 With the freedom to experiment we were resolute about not letting them down and took it up as a challenge to rank Campmonk's website on the top of the Search Engine Results Page (SERP) in a shorter period. Campmonk was soon ranking on the first page of SERP within 63 days of our SEO campaign. Not that we didn't expect this to happen, but we definitely were amazed by the time taken by the campaign. 2.07 months were too less, given the nature of competition for the keyword. And still, we did it with absolutely nil cost. Here’s a young company that knows about the SEO business. They deliver what they promise and are sure to add value to your business. First Launch had effectively created a good foundation by optimizing our website to rank on search engines thereby increasing our organic reach.